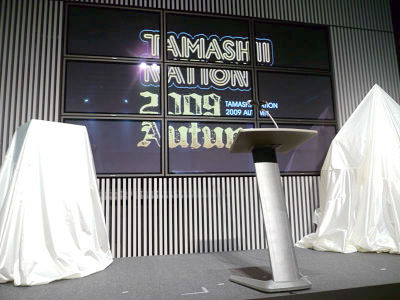 From tomorrow in Akihabara, Bandai is to run "TAMASHII NATION 2009 Autumn AY YEAH! SAY YEAH!" 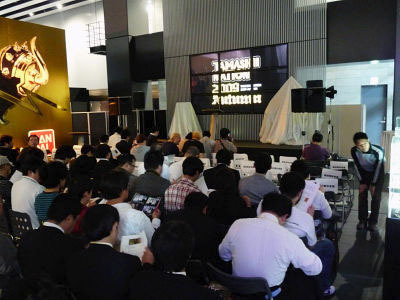 the great exhibition event which features BANDAI's spirited toy products. Today is the press day for the event and there we found the life size "Gold Cloth" worn by characters of the fighting manga and anime Saint Seiya, which is truly realistic in size and weight. 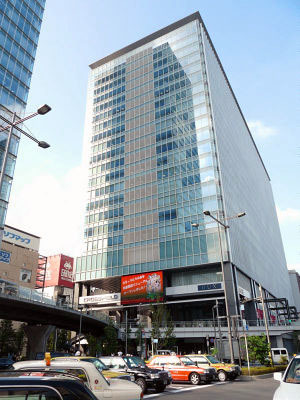 The 2nd floor of Akihabara UDX is the site. Something is veiled on the stage. The...Cloth Box of the Saint? 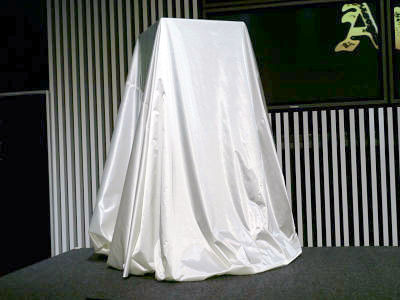 Unveiled by Bandai's president and guest comedian Kirin. "1/1 Life-Sized Pegasus's Cloth Box". The inner box is made of wood, while relievos are made of FRP and urethane. Sized H700*W500*D500mm(about 2.2*1.6*1.6 ft.) and weights about 20kg(about 44 lbs.). Can be shouldered just like manga. You too can shoulder this from tomorrow at Akihabara UDX. Never mind the foamed polystyrene in the box. "1/1 Life-Sized Gold Cloth of Libra"
The Cloth was worn by Libra Dohko, the 7th Gold Saint of 12 Palaces in Sanctuary, and also a master to protagonist Dragon Shiryu. 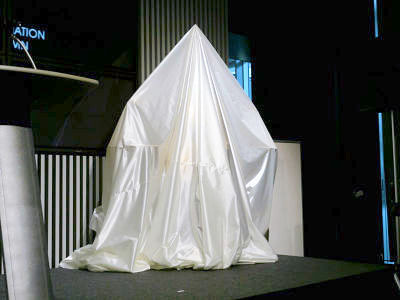 Bandai drafted the Cloth not only for exhibition but also for actual wearing in this reproduction. Each parts are made of FRP and gold plated or painted. The scale symbolizing the Libra. The Libra is the only Gold Saint who is allowed to use weapons by the goddess Athena, so many weapons like clubs and swords are embedded in the Cloth. Each weapon is constructed neatly to detail. 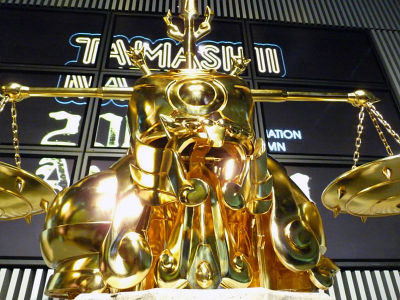 Made for TAMASHII NATION 2008 event and displayed all over the world. Regarding wearer Sagittarius Aiolos's tallness(about 6.1ft.) the cloth is made rather big. Also designed to be actually worn.